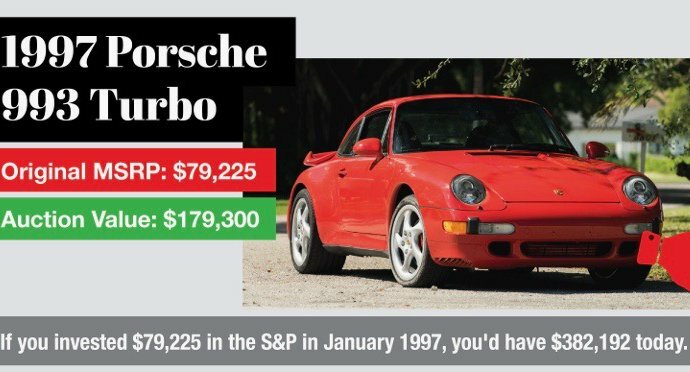 Better investment: Porsche or S&P? So which has provided a better investment opportunity: Buying a Porsche or putting that same money into the stock market? RimBlades USA wondered, and put its money where its mouth is, so to speak, doing research to compare the relative long-term values of various Porsche models vs. putting the same amount of money into the stock market. The benchmark Standard & Poor’s 500 Index was used to determine the non-Porsche investment. Several Porsche models from 1956 through 2015 were used in the study, which started with the MSRP for each vehicle, considered an investment of the same amount being made on January 1 of the car’s model year, determined the 2018 value or auction price for each vehicle, subtracted the MSRP and then used the DQYDJ S&P Periodic Investment Calculator to determine the stock market yield over the same time period. Note: The amount did not include vehicle maintenance or insurance, nor the taxes that would have been paid on stock market gains. “After doing the calculations, the results are highlighted on the graphic,” RimBlades USA said. For example, “If you paid the $3,000 MSRP for the 1956 Porsche 356A 1600 Speedster, you could sell it today for a profit of $305,000. However, that same $3,000 could’ve become $617,457 if it had gone into the S&P. There were similar results for a 1997 Porsche 993 Turbo and 2004 Porsche Carrera GT. However, the 2015 Porsche Spyder is $74,000 ahead of the S&P.